Clarion Vines is a column for the future wines of history. You can find an introduction to the ideas at work between the glass, the nose, and the pen here. Tasted on November 1-2, 2014 in Warsaw, Poland. Spice bordering on mint. Cedar humidor with Dominican cigars in it. Almost a pine. Big and young and sultry and dancing. Vanilla bean ice cream minus the sugar. Nose in glass on a long pull is like flying over a field of grass at great speed. Green olive minus the vinegar and salt. Essence of a pecorino Romano (yes, there is something of cheese in there). Also essence of aged balsamic vinegar; the kind you can sip on its own in Italy. Rests like a sleeping crocodile between the middle of your tongue, with its tail dropping down into your throat. Oak burnt in a chimney in early winter. Leaves your mouth feeling as it does there after having a good glass of fresh milk at room temperature – also the aftertaste. Tannic – too much so. Simplified in the past hour, and concentrated to one somewhat sharp scent. Almost Uncle Bob’s leather-lined oak casket, filled with plum and berry Yankee Candles instead of his corpse. A barbed fish-hook of thick, fruity alcohol keeps one drawing long breaths. Not nearly as tannic as an hour ago. The finish seems to rest between the teeth and lips and then extend as far back in the throat as one could reasonably go before falling in. Still has that tongue-coating milkiness, which endures for the longest part of its (sufficiently long) finish. Warmth – now we’re cooking with gas. The acidity cries out for hollandaise sauce to balance its personality. Or Ribeye. Or more wine. Spice and heat in the nose. Warm fruit on top of cedar. Anise plus mint. All still primary, no really abundant secondary. Delicate and perfumed, but in the bold way that way that perfume lingers on my clothes even if my wife wore it yesterday. Beginning to have the Bordeaux flavour profile, even the Basic Bordeaux Nose (BBN). Finish is beginning to be full mouth. Colour is deep garnet. Must from a closet with a hollow pine door. Sharp BBN. Makes you thirsty. Soft-water richness. Balanced, blueberry front mouth-puckering tannins, like it is making you prepare for a big cartoon kiss. Spice. Ground black pepper. Was that nutmeg? I think this wine could be open for another 24 hours and still improve. But the bottle is now dry. It is like two rough cat tongues of sweet fruity goodness are licking my nose. The oak is true and thick. A bit grainy when rolled over the palate. Leaves the mouth wetter than yesterday, or at least not as dry. Maple syrup on the nose, perhaps. A spot of sediment already in the bottle. Grape lollipop on the nose, too. The wine is very young. However, I found it completely drinkable and enjoyable on the second and third day of tasting. It is a less refined wine than the Talbot 2010 that I tasted with it, and which I thought was slightly better as an ageworthy wine. 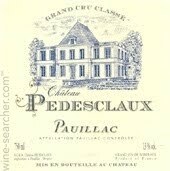 But Pédesclaux 2009 is like a St. Bernard puppy: it is already full grown, even before it has grown up. The wine is straightforward, but not simple. Within the flavour profile, there is a lot that should integrate and develop into a beautiful example of a Pauillac, from a good vintage (and a vintage that is more affordable than the one that followed it, which may not be any better bottle-for-bottle). If I had to make an educated guess of roughly when to drink it, it is the early hours of the afternoon of October 3, 2022 (GMT). But it may still be okay the following day. Oxford mark: First class- alpha-beta, αβ (70). CV advised: Yes, for cellaring with expectation of substantial improvements, especially the development of secondary (even tertiary) characteristics, as that fruit slowly cooks into the amble oak. Jonathan D. Price is Executive Editor of the Clarion Group. He tastes from England and the Continent.